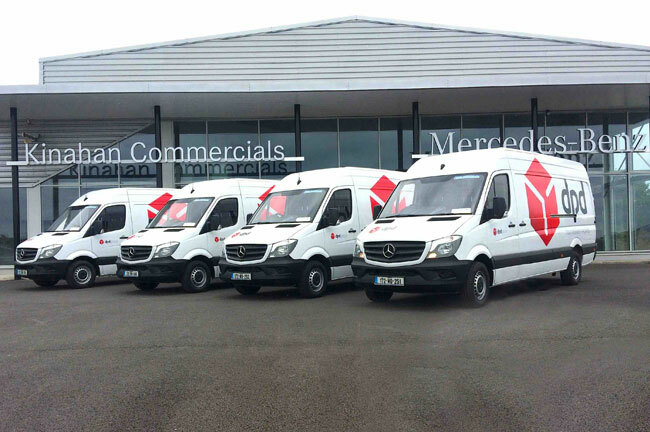 Two DPD parcel delivery franchises have taken the decision to enhance their fleet of commercial vehicles with the recent addition of two new Mercedes-Benz Sprinter vans each. Supplied by Mercedes-Benz commercial vehicles main dealer, Kinahan Commercials of Moate, two of the new units will operate from the Mayo depot in Foxford with the other two servicing the Longford/ Roscommon base. Finished in DPD’s white, red and black livery and complete with the Sprinter 21st birthday pack, the 314/43 vans all feature an upgraded radio with 14.7 cm TFT display (Audio 15), cruise control, multi-function steering wheel, reverse camera, leather steering wheel and adjustable steering column. With roots tracing back to 1986, DPD Ireland now handles in excess of 13 million parcels per year. Recently the company doubled its hub size and trebled its sortation capacity from 7,000 to 21,000 parcels per hour.